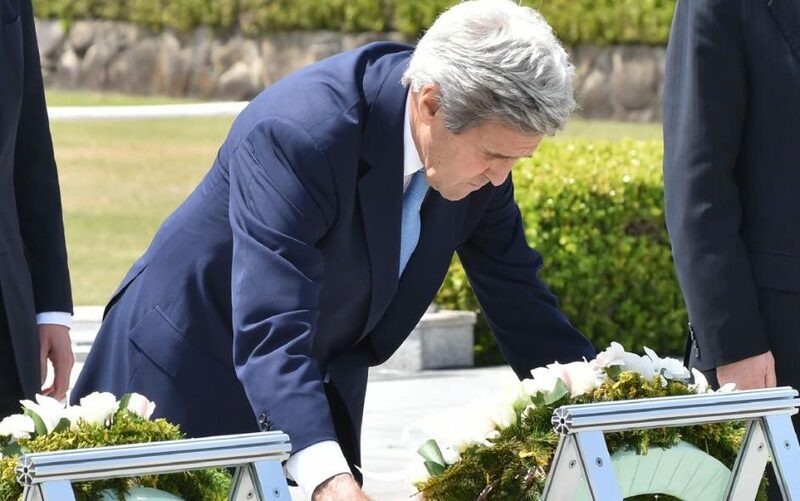 John Kerry, the US secretary of state, had not even appeared at Hiroshima’s peace memorial before word leaked that US president Barack Obama could visit Hiroshima at the end of May following the G7 meeting in Shima, Japan. 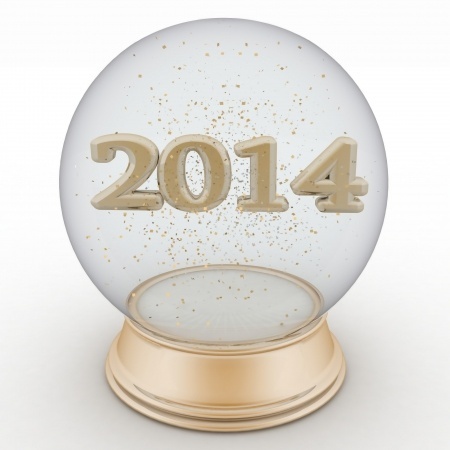 The Obama administration, it’s safe to say, is in full legacy-building mode. Last month, Myanmar’s government transitioned to a democratically elected government (and, yes, Kerry’s predecessor at State, Hillary Clinton, played a critical role in US support for Burmese democracy). There’s the landmark deal of the ‘P5 + 1’ countries with Iran to bring more transparency to its nuclear energy program and, possibly, its nuclear weapons ambitions. There’s the opening to Cuba after decades of isolation and resentment on both sides of the Straits of Florida, and Obama’s historic visit to Havana. Photo credit to AFP / Getty. My dear friends, on behalf of Japan and the Japanese people, I offer with profound respect, my eternal condolences to the souls of all American people that were lost during World War II. Though Abe expressed deep repentance for Japanese actions that caused suffering to Asian neighbors, and though Abe said that Japan must not avert its eyes from that, he bluntly noted that ‘history is harsh’ and that ‘what’s done cannot be undone.’ Presumably, that includes the abduction of women forced into sexual slavery by the Japanese army during World War II across much of Asia, chiefly in Korea, which remained under Japanese occupation from 1910 to 1945. Even discussing the issue today is still widely controversial in both Japan and South Korea, but it’s enough of an affront to South Korea that South Korean president Park Geun-hye has only met with Abe once — and apparently, she was less than impressed with Japanese diplomacy. Abe’s refusal, and the refusal of prior Japanese prime ministers, to apologize has caused diplomatic tension with China and, more importantly for US purposes, South Korea, which US officials hope can become a closer Japanese ally in their mutual quest to balance China’s growing regional power. Though the US-Japanese relationship is strong today, it’s odd, upon reflection, that a Japanese official would apologize to the country that deployed not one, but two, atomic bombs on Japan while remaining recalcitrant vis-a-vis Korea. Mike Honda, a Democratic member of the US House of Representatives from California and himself an American of Japanese descent, brought Lee Yong-soo, a Korean woman forced into service as a ‘comfort woman’ in 1944 at the age of 16, to Abe’s congressional address in protest. Mistrust between the two countries runs deep. Surveys show that Abe is more unpopular throughout South Korea today than North Korea’s leader, Kim Jong-un. 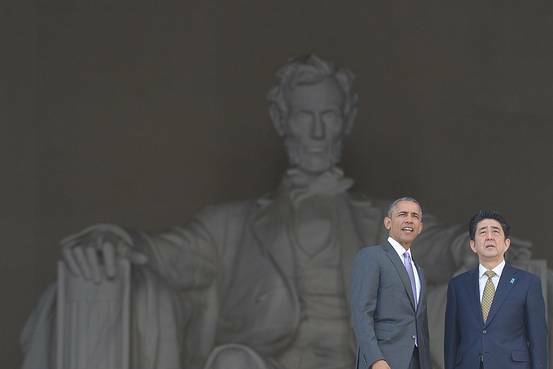 The apology issue was the most contentious of a broad portfolio of policy issues between the United States and Japan, as Abe continues his red-carpet visit to the United States, which included a personal tour of Washington’s monuments with US president Barack Obama (pictured above with Abe) and a state dinner on Tuesday night. Photo credit to Kazuhiro Nogi/AFP/Getty. 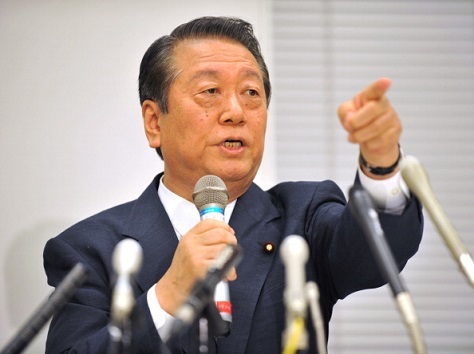 In Japanese politics, few figures loom larger than Ichirō Ozawa (小沢 一郎), who has been a MP in Japan’s parliament since 1969. On Sunday, he faced the largest challenge of his political career, when as the leader of the People’s Life Party (生活の党, Seikatsu no Tō), he struggled to hold onto his own constituency in northern Iwate prefecture, campaigning in his home city of Ōshū for the first time in three decades. 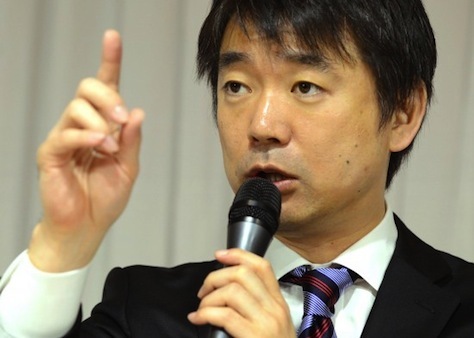 As it turns out, Ozawa (pictured above) held off his opponent by more than 10 points, winning one of just two seats for the People’s Life Party. 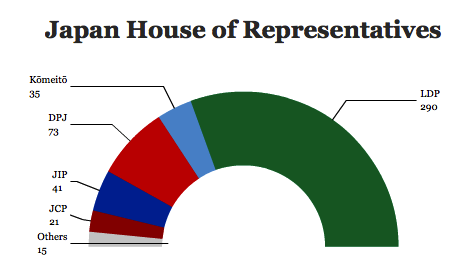 So while Ozawa will return to the House of Representatives, the lower house of Japan’s parliament, the Diet (国会), he will do so as an increasingly isolated relic after reaching the pinnacle of leadership in both the dominant Liberal Democratic Party of Japan (LDP, or 自由民主党, Jiyū-Minshutō) of prime minister Shinzō Abe (安倍 晋三) and the opposition Democratic Party of Japan (DPJ, or 民主党, Minshutō), which held power for three tumultuous years from 2009 to 2012. 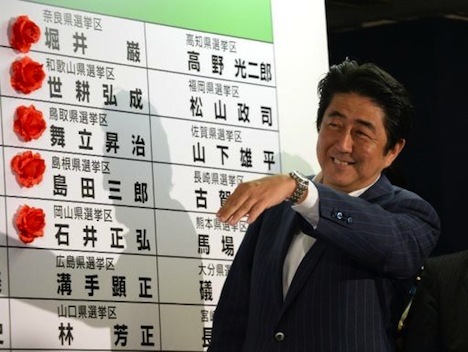 As expected, Japan’s prime minister Shinzō Abe (安倍 晋三) and the governing Liberal Democratic Party of Japan (LDP, or 自由民主党, Jiyū-Minshutō) easy won snap elections called less than three weeks ago. Despite growing doubts about Japan’s precarious economy, which entered an official recession last quarter, Abe maintained a two-thirds majority in the lower house of Japan’s parliament. The most amazing fact of the election is that Japan’s opposition parties, despite a feeble effort against Abe’s push for reelection, lost virtually no ground. Nevertheless, it’s hard not to conclude from the results and the sudden December election campaign that Japan today has essentially returned to one-party rule for the time being. 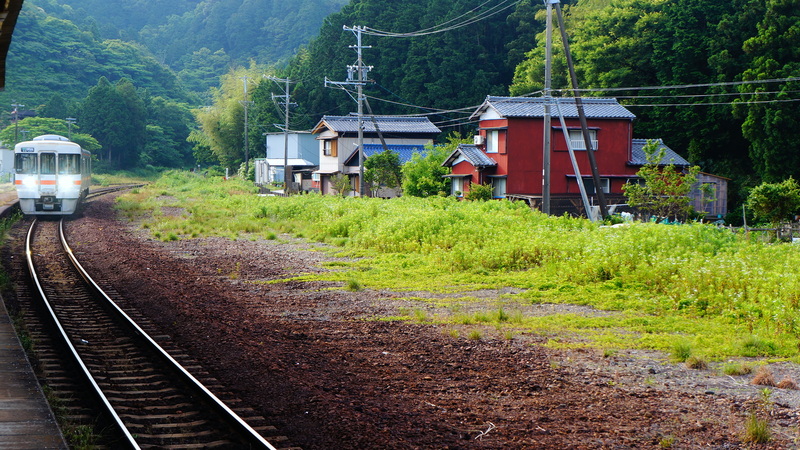 It puts a grim end to a period that began in 1993 with the first non-LDP government in over 40 years, and that culminated with the clear mandate of the Democratic Party of Japan (DPJ, or 民主党, Minshutō) in the 2009 general election. 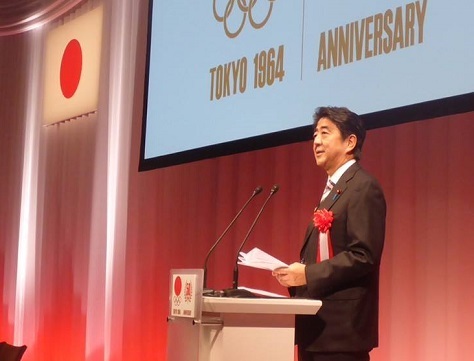 The DPJ cycled through three different prime ministers in three years, and it often appeared to stumble in its efforts to respond to the global financial crisis, longstanding declines in demographic and economic trends and the 2011 meltdown of the Fukushima nuclear reactor. 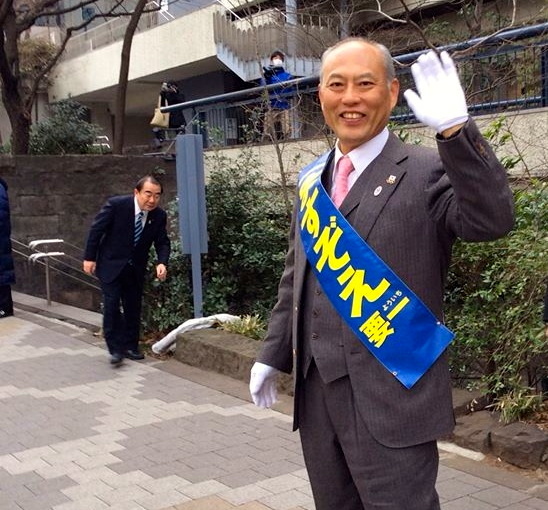 By December 2012, with promises of a massive new wave of monetary and fiscal stimulus, Abe (pictured above) swept the DPJ out of office, wining a two-thirds majority in conjunction with its junior coalition partner, the Buddhist, conservative and generally more pacifist Kōmeitō (公明党). 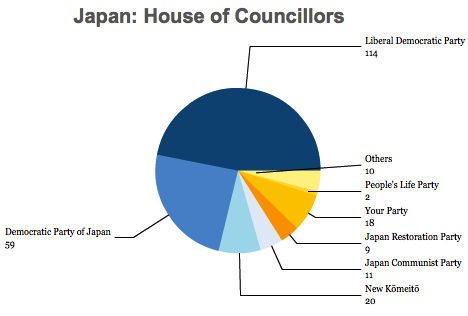 That coalition, which controlled 326 seats in the House of Representatives, the lower house of Japan’s parliament, the Diet (国会), will now control 325 seats after Sunday’s election. Barely hours after the news that Japan is entering a recession, with an annualized GDP drop of 7.3% in the second quarter and 1.6% in the third quarter, prime minister Shinzō Abe (安倍 晋三) has announced snap elections that will be held sometime in mid-December. 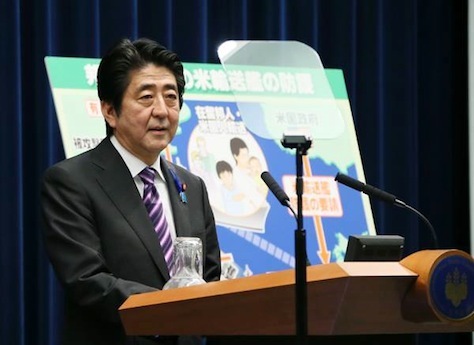 Ostensibly, Abe’s rationale is his determination to postpone the next installment of Japan’s consumption tax increase, which jumped from 5% to 8% in April and is set to rise further to 10% in 2015. But that’s an obvious fig leaf — the consumption tax is the legacy of the opposition government that Abe defeated in his landslide victory in December 2012. Instead, Abe hopes to maximize his government’s relative popularity and to take advantage of a scattered opposition to win a rapid mandate next month and extend the LDP’s control for another four years instead of waiting to face voters in 2015 or 2016, when the opposition could be stronger and when Abe’s policies might be even less popular. Abe also faces an internal LDP presidential election next year — it will be hard for rivals to attack Abe so soon after a successful election victory. 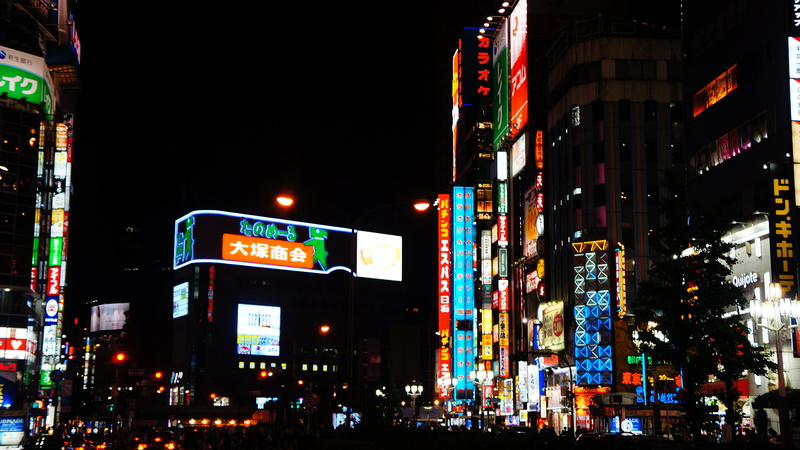 Earlier this month, Japanese prime minister Shinzō Abe (安倍 晋三) moved forward with plans to increase the top rate of Japan’s consumption tax from 5% to 8%, effective as of April 2014 — and he is expected to allow the rate to rise further to 10% in autumn 2015. 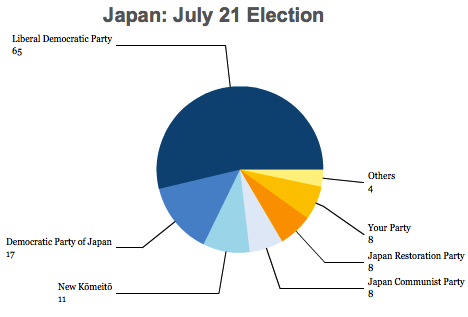 It was the first major policy decision since Abe led his party, the long-dominant Liberal Democratic Party of Japan (LDP, or 自由民主党, Jiyū-Minshutō) to a landslide victory in the July vote that elected one-half of the seats (121) in the House of Councillors, the upper house of Japan’s parliament, the Diet (国会). 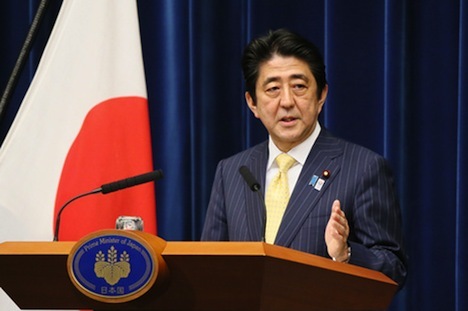 That vote was essentially a referendum on Abe’s big-spending economic stimulus program — widely called ‘Abenomics’ — following Abe’s equally impressive victory in December 2012 in the elections for the House of Representatives, the Diet’s lower house. 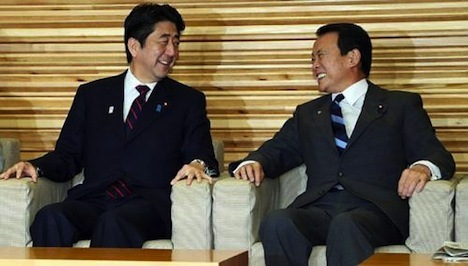 When Shinzō Abe (安倍 晋三) returned to power in December 2012 in a landslide victory, he did so with a platform of fiscal stimulus that makes previously profligate governments of the long-dominant Liberal Democratic Party of Japan (LDP, or 自由民主党, Jiyū-Minshutō) seem like budget hawks. What a difference three years in opposition makes. Abe previously served as prime minister from 2006 to 2007, a term most distinguished for Abe’s nationalist rhetoric with respect to the People’s Republic of China. 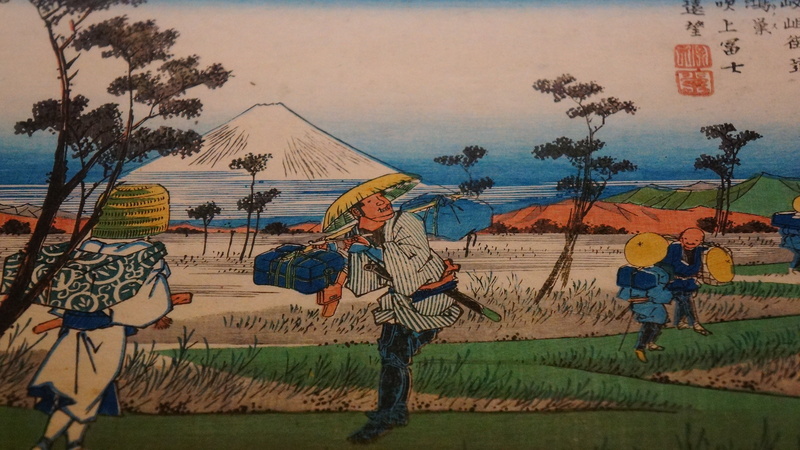 Although the LDP has never been terribly allergic to public works projects, Abe returned to office with a campaign pledge to use government as a tool to spur the Japanese economy in a way that no Japanese government has contemplated since low-growth malaise took hold in the late 1980s and early 1990s. Audacious doesn’t begin to describe what’s already become known as ‘Abenomics,’ and with a two-thirds majority in the lower house of Japan’s Diet, Abe has already embarked on a program of ¥12 trillion ($136 billion) in spending on public works and other stimulative measures designed to be a down payment on up to ¥200 trillion in spending over the next decade. That’s even more striking in contrast to the prior government controlled by the now-decimated opposition, the Democratic Party of Japan (DPJ, or 民主党, Minshutō). DPJ prime minister Yoshihiko Noda (野田 佳彦) spent much of his time in office passing an increase in Japan’s consumption tax from 5% to 10%, which should take effect starting in 2014, though all bets are off if the LDP wins a rout in this summer’s elections to the Diet’s upper chamber, the House of Councillors. But the truly radical step has been Abe’s willingness to advance a vision of monetary policy that, until now, has been advanced only by the likes of Paul Krugman and other folks with views less orthodox than your average central banker. 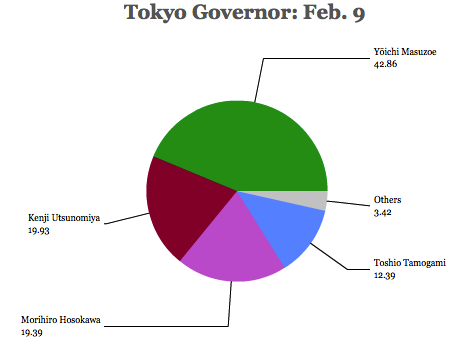 During the campaign, Abe blatantly called on the Bank of Japan to raise its inflation target to 2% or even 3% after years of deflation, and he pledged to force the Bank of Japan to purchase construction bonds from the Japanese government, making it clear that he is willing to intrude on the traditional independence of Japan’s central bank. Last year, it was seen as a radical step when Federal Reserve chairman Ben Bernanke set an explicit U.S. inflation target of 2% for the first time in a century of U.S. central banking history. With the term of BoJ governor Masaaki Shirakawa (白川 方明) ending in April 2013, Abe was always certain to get his way on monetary policy. With Shirakawa’s early exit, however, Abe has gotten a head-start in nominating Harhuiko Kuroda (黒田 東彦), currently the head of the Asian Development Bank, as the next BoJ governor. 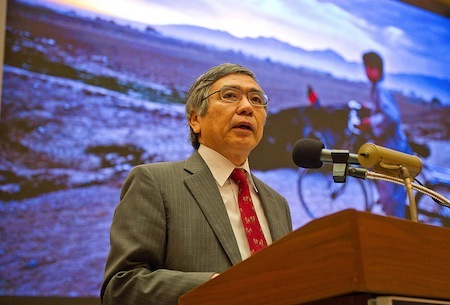 Kuroda (pictured above) has been the president of the Asian Development Bank since February 2005, and he previously served as a vice minister of finance for international affairs from 1999 to 2003 and as a special adviser to the LDP’s reformist former prime minister Junichiro Koizumi (小泉 純一郎). 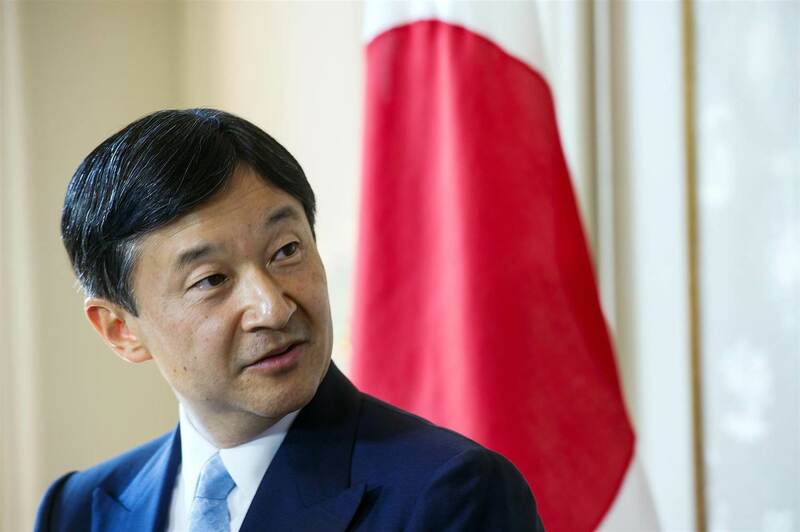 He will take over at a time when interest rates have been at zero for years, and deflation has been a problem for Japan for so long that investors expect structural deflation. [He] has been very critical of the BoJ’s failure to eliminate deflation, and has strongly supported aggressive balance sheet expansion, and forward policy guidance, to achieve a 2 per cent inflation target. He has not, however, argued in favour of BoJ purchases of foreign bonds, which is one of the litmus tests being used by investors to gauge the attitude of the new incumbent…. Mr. Kuroda might be seen as a compromise candidate who could win the support of the Upper House of the Diet, a chamber which Mr. Abe does not control. There are about a half-dozen bank governors who really, truly matter in terms of establishing what’s considered mainstream global monetary policy — and Kuroda will likely now be one of them, joining Bernanke, European Central Bank president Mario Draghi, Swiss National Bank president Thomas Jordan, and Canadian central bank governor Mark Carney, who is set to replace Mervyn King as the Bank of England governor in July 2013. Kuroda’s appointment is important not only to Japan, obviously, but to the world in at least two ways. First, monetary policy in the Abe-Kuroda era will have a ripple effect on the global economy — after all, Japan does have the world’s fourth-largest economy with a GDP of around $4.6 trillion, just about 30% of the size of the entire U.S. economy. 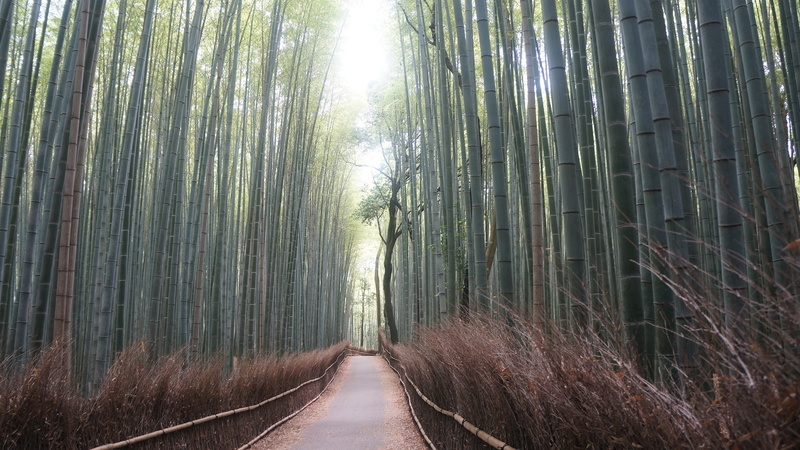 Markets, in fact, are already moving in anticipation of expected monetary easing — the value of the Japanese yen has dropped about 20% since last October, and the value of Japanese stocks has risen by 28%. It goes without saying that if Abe can spur the Japanese economy out of deflation and into a phase of higher growth, with greater Japanese consumption, it would boost the global economy, as well as the U.S. economy. Second, to the extent Kuroda succeeds in his experiment, it will provide a more ambitious central banking precedent that could pull monetary policy worldwide to a more relaxed view about inflation.